I had been daydreaming about designing my own landscape since my first landscape design class in 2001. As we signed the papers to purchase our first house in 2012, the ideas were flying. I was my own client and I was ready to get started! At the time, we had a community garden plot and also a small plot at our apartment complex. I grew herbs and veggies and had a berry bush and strawberries in pots. Although it was June, I dug up what I could and hauled the pots over to our new home. Most of the plants stayed in pots that first year as I observed the space and drew up a pan. 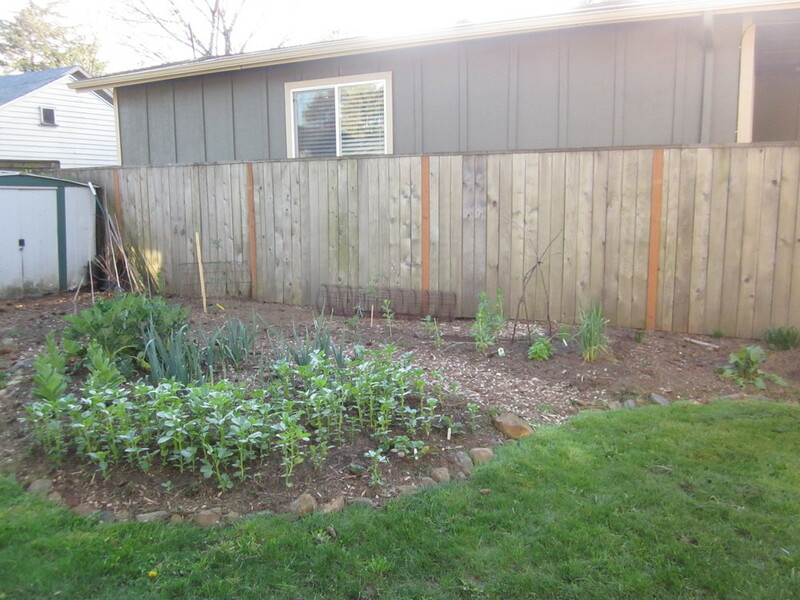 Our yard is a standard Portland city lot and measures roughly 50 x 100 feet. A huge Doug Fir tree stands at the south end of our back yard and another towers over our east fence in our neighbors yard. These beautiful native trees offer great habitat for birds, squirrels, and even a resident raccoon. The downside is they cast a decent amount of shade on our south facing back yard. My first challenge was locating our vegetable garden. I observed the sun and shade throughout the day and found the sunniest spot in the back yard. This would be our vegetable garden. I gathered our flattened moving boxes and got to work. A great permaculture gardening trick is sheet mulching. There is no right or wrong way to do it, although you can find great instructions in Toby Hemenway's book Gaia's Garden. I put down a double layer of cardboard boxes, making sure to overlap the edges, and began layering with chicken manure (brought over from the woman we buy eggs from), coffee grounds (picked up for free at a local coffee shop), wood chips (delivered for free from a local tree company), and a 3-way soil blend that we purchased in bulk. Since I wanted to plant veggies immediately, I chose the 3-way blend. It wasn't as hot as pure compost or manure so it didn't burn the young plants. After sheet mulching the new vegetable garden, I wanted to get a cleaner look with defined bed lines. I pulled out my favorite tool for the job - my garden hose! Having already decided where to locate the veggie garden, I looked around the space and considered what other design elements we wanted: a medicinal garden, several dwarf fruit trees, compost bins, tool storage, berry bushes, a gathering space (or two), chicken coop and chicken run, a clothes line, bike parking, and recycling/trash/compost bin storage. How would I fit all the pieces together? I began pulling the hose around the weedy back yard, bumping it out here, in right there, tweeking the curves, looping back around the Doug Fir, and the space took shape. Within 10-15 minutes, the vision was clear and I was well on my way to the dreamy back yard I imagined over 10 years ago. Although I do not typically design landscapes in this manner (hands-on work before sitting down at my drawing table), I really enjoyed this process. Due to our partly shady back yard, I let the sunny veggie garden dictate the rest of the space. The single curve that emerged from my initial sheet mulching project determined the look and feel of the entire space. I put in some cute edging between the lawn and gardens with materials I found on site - first sized rocks and bricks that were left after our chimney was removed. Then I went back indoors to the projects that awaited me there. During our first winter in our new home, I did measure the back yard and my new bed lines and I sat down to draw up a plan. I have seen enough trees and shrubs planted too close together (or too close to the foundation) and I knew better than to start planting trees and shrubs without a plan in hand! I'd love to hear from you! What projects have you done in your yard? What lessons have you learned?